VOX is a modern technology company that truly wants to make a difference in the world. Yet, it is our approach to creating this change that sets us apart. By infusing a deep-seeded belief in creating committed partnerships, engaging in our communities and empowering individuals to have a stake in the process, we create a collaborative prosperity that positively affects people, businesses and the world. As part of the VOX ‘Prosperity for All’ mantra, we believe that by engaging in our community and investing our time and resources, we can make a meaningful difference. The following is one such example of how we seek to achieve this difference. I also learned about a place called the St. Francis Center that offers a variety of assistance to this growing population in Los Angeles. Not a shelter, they provide things like free breakfast, a shower and donated clothing to those most in need. Inspired to make a difference in the lives I uncomfortably walked past a week earlier, I rounded up 8 large trash bags filled of clothes and shoes and headed to the St. Francis Center. On that visit I learned that there were also opportunities for volunteers to literally serve this population of fellow human beings currently living in the streets of Los Angeles. In other words, in lieu of money or donations they would gladly accept your time and energy towards this rapidly growing problem. I wanted to make a greater difference. I was inspired. So I acted. Now, first I must say that Scott Landis does an unbelievable job of creating a culture of inspiring others and a giving back to our local communities at VOX. Whether it is supporting charitable events, individual contributions, service related activities or simply raising awareness about local issues, Scott encourages and enables each one of us at VOX to make a difference in all that we do. So, I asked several of my colleagues to commit a ½ Day towards helping this growing problem in Los Angeles. And on June 20th, 7 of my fellow VOX family served ½ Day at the St. Francis Center. 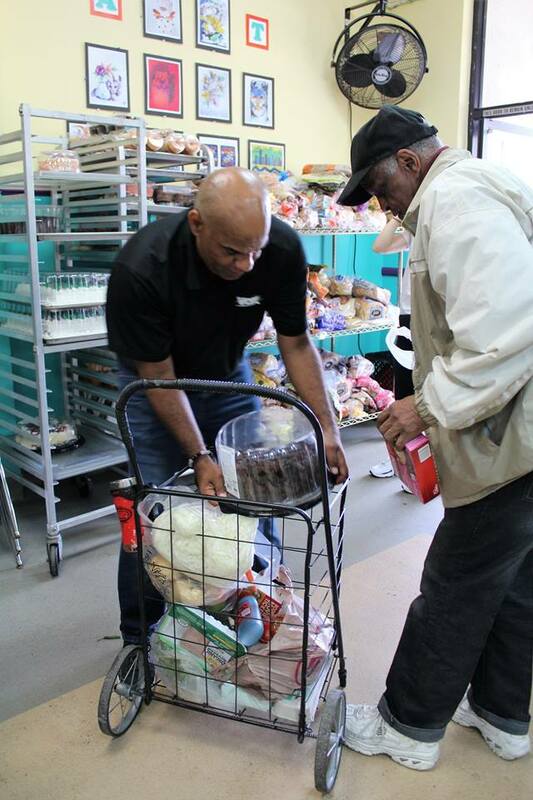 Each one of us armed with “in kind” donations before we worked and served together during their pantry service. 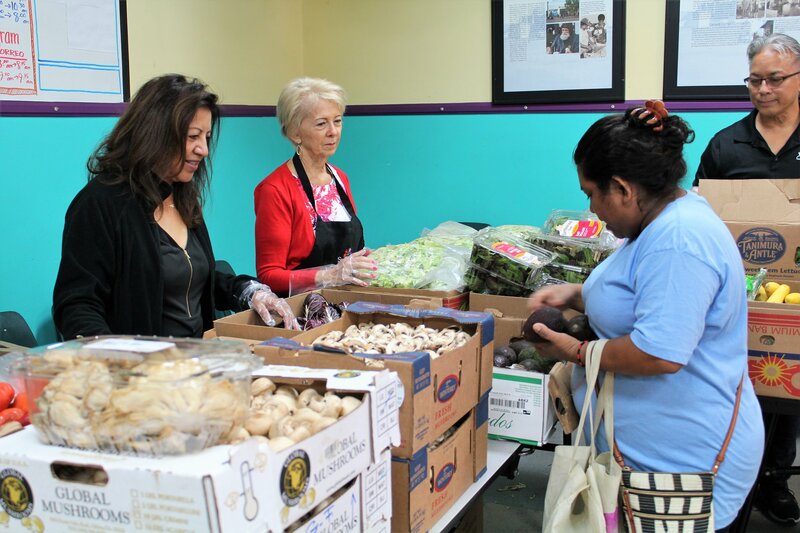 The pantry service provides healthy fruits and vegetables donated from local restaurants to perishables items like Organic Vegetable wraps donated by companies like Trader Joe’s and Starbucks. Creating a quasi-farmers market shopping experience for many of the “food insecure” population living in Los Angeles. Those who often worry about securing their next meal. Boy was it eye opening. There, we met people from all walks of life from individuals with mental disorders to military veterans to entire families who live below the poverty level all just looking for that next good meal. Small children and all. The experience couldn’t have been more eye opening and rewarding at the same time. Each VOX employee becoming more inspired to bring greater awareness to this growing problem and make a difference to those souls we had served earlier in the day! The mission of St. Francis Center is to feed, serve, and walk with the poor as a community of hope in the spirit of Saint Francis of Assisi. St. Francis Center could not exist without the generosity of individual donors. The organization depends on these donations to provide programming and maintain its facilities. If interested, you can mail donations to 1835 S. Hope Street, Los Angeles, CA 90015 or donate Online with the link below!